The background story of Fargoal is definitely not one of its more enduring qualities, but I suppose there are only so many pretexts that can explain why a sane individual would take it upon himself to go romping through a trap and monster-infested dungeon, all by his lonesome. The "plot" of Fargoal, if we can call it that, amounts to finding a magical sword (the game's namesake) which will allow a blind hero named Gedwyn to conquer an evil wizard, Umla. As far as I can tell, the "story" to this game is available only in the game manual. The game itself doesn't seem to make any references to Gedwyn or Umla. Indeed, players who manage to win the game are merely told that "The Quest is Complete!" Obviously, the storyline isn't what makes this game noteworthy! Like many games of this era, the "story" was probably an afterthought, and it's told entirely in the manual. 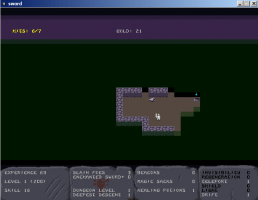 In many ways, Fargoal is a typical "dungeon crawler." There's not much to do beyond descending deeper and deeper into the dungeon, slaying increasingly stronger monsters. True to Nietzsche's claim that "What doesn't kill you makes you stronger," your avatar will emerge from each victorious battle with a bit more "experience." Eventually, when the avatar has accumulated enough experience, he will gain a level, which brings with it a boost in his stats (he'll be able to take more damage before dying as well as mete out more punishment to his many enemies). The avatar can also bring the gold he finds to special "temples," where he can sacrifice it to the gods for instant experience. Fargoal on the VIC-20: While not as sharp as the C-64's version, in some ways the VIC version is a greater technical achievement.Fargoal is presented in a 2D, topdown view. At first, the dungeon is almost entirely shrouded in a dense fog. As the player explores the area, the map is automatically updated, and the world under the fog is slowly revelaed. Since each dungeon level is randomly generated, however, going upstairs and back down will not bring the player back to same area--a new map must be made each time the avatar goes up or down a level. While this fact might make the game slightly less "realistic," the upside is that each level is a slightly new experience, guaranteeing a high replay value. This feature is why many reviewers like to compare Fargoal to the venerable old unix game Rogue. Combat is initiated when the avatar moves onto a square containing an enemy, or when an enemy moves to intercept him. If the enemy intercepts, then the fight is to the death. If the player initiates battle, though, he can run away if the fighting gets too intense. After a battle, the avatar's hitpoints begin automatically generating, though standing on a temple square will speed up the healing process. There are some 20 types of creatures you can encounter in the dungeons, randing from "human type" beings like Elvin Rangers and Dwarven Defenders to more traditional "dumb brute" types like ogres and werebears. Obviously, players interested in their avatar's survival will learn which creatures are too tough for their avatar at his present level and avoid them. There are also traps sprinkled throughout the dungeon. Some explode, others involve cave-ins, and others are pits that will not only damage you, but also drop you into a lower and more dangerous level of the dungeon. Thankfully, everything in the dungeons is not out to kill you. Besides the many sacks of gold lying about, there are an assortment of magical scrolls to give your avatar an edge. The most important of these is the teleport scroll, which can be used to avoid taking damage from the traps. There are also scrolls to speed up the healing process, strengthen the player's defenses, make the player invisible from monsters, and light up unexplored portions of the dungeon. The player can also find healing potions, which instantly heal the avatar after a battle or trap. Finally, the player can also find enchnated weapons to help him vanquish foes. Strategically marshalling these resources will make a huge difference in the quest to retrieve Fargoal. 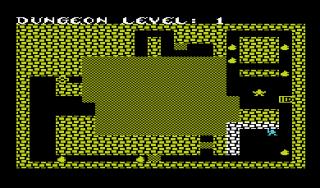 Much like DynaMicro's Dungeons of Daggorath for the TRS-80, Fargoal incorporates lots of techniques to help ratchet up the tension and keep the player on the edge of her seat. The key trick is the fog effect. As the avatar roams the dungeon, he's never sure what manner of creatures the fog is hiding. They can emerge from unexplored areas at any time, even (or perhaps, especially when) the player has just barely survived an encounter and hasn't had time to heal. The fog helps recreate some of the real-life anxiety we feel exploring new environments in which we don't know what to expect around the next corner. There are also "mystery squares" that could be valuable treasures or vicious traps--the only way to know is to step onto them and hope for the best. These little games of chance also keep the player in suspense. Probably the most noticeable mood setter, however, is the innovative use of sound. In Fargoal, this amounts to the playing of two sinister-sounding chords at regular intervals. These chords signify the movement of monsters around the dungeon. These creepy sounds are nicely balanced against the other sounds, such as the chirpy effect that follows acquiring a treasure. There's also a snippet of heroic chords when the avatar triumphs over a monster. Essentially, the various sounds and music in the game lend tremendous ambience to the avatar's actions. If you have any doubts about McCord's genius with sound in Fargoal, try playing the game with the sound turned off--and watch a formerly exciting game become a dull plod through a boring dungeon. Finally, the real-time effects of monster movement, hit point regeneration, and the timed sequence at the end of the game add even more suspense. A player who leaves the game for a cup of coffee may find his avatar dead when he returns--the monsters won't wait, but continuously prowl around the dungeons searching for blood. Furthermore, monsters can always come up the stairs, so a level is never totally "clear." The only place where the avatar can rest safely is in a temple, which are far and few between in the dungeons. Likewise, since hit point regeneration can take some time, it's necessary to work hard to avoid encountering other monsters when the avatar is weak. A wrong move into a trap or fresh monster can lead to sudden death. If a player actually manages to find the Sword of Fargoal (and I must admit, I have yet to do so! ), the game gives him 33 minutes to clamber back up to the top. If 33 minutes sounds like a long time, consider that due to the random dungeon setup, each of those 15-22 levels will be unexplored and crawling with monsters. Sword of Fargoal is not a game for wimps. There are many ways to enjoy Sword of Fargoal today. "Purists" may want to seek out the original VIC 20 version, but most folks will probably want the enhanced version for the Commodore 64, available on this fanpage with the permission of the author (along with the much-needed manual). Both of these ROMs will require a proper emulator; I recommend VICE. If emulation isn't your bag, then I'd highly recommend the authorized remake of Sword of Fargoal by Paul Pridham and Elias Pschernig. There's a version for the PC and the Mac. From what I can see, the remake is excellent and highly configurable (each enhancement to the original game is optional). This remake is shareware, so folks who find themselves playing it constantly ought to pony up $10 to reward Paul and Elias. Happy hacking! So, I take it that we don't have any Fargoal fans here at AA? :-) Geez, I was expecting this review to attract more attention than the Dungeons of Daggorath article! I'm thinking I might look into Wizardry and the Akalabeth next. I have a free cell phone remake of Akalabeth done in that portable Java language (just do a search and I'm sure you'll call it up). It's pretty good, though Akalabeth is a very difficult game to enjoy, frankly, as it IS primitive by any standard. I also have the official remake for the PC from my Ultima Archives collection. I made a point to collect Wizardry I - III on the Apple II. I have yet to play them though, but am anxious! I have the later ones on a variety of systems. It's not much of a game now, but it did lay the groundwork in 1979 for a lot of what was to come, with the added bonus of it making some good money for Richard Garriott. while trying to stay alive!! Hit Points	Amount of Damage you can absorb before death. Strength	Related to damage you inflict against monsters. Dexterity	Related to the probability of hitting a monster. Stamina	Related to defense against monsters. Wisdom	This attribute is used in special (quest!) routines. To buy an item one need only type the first letter of the item wanted. game is started in a town somewhere on the 20 x 20 map. Towns - The adventure shops -trade, buying equipment. Castle - From this point one may embark on quests by which the game is won. Dungeons - Where the evil things lurk. Go now into the world and seek adventure where thou might!!! P.S. Search out the castle of Lord British - use X to go in! conversion is to be included with the release of Ultima IX: Ascension. It will be placed in the vault of Ultima towards the end of the game. about and take you back to the past. Windows 95, Windows NT 4.0, or higher. British. He will then give you a quest to slay some vile monster. return to Lord British and he has you kill an even harder monster. to see the true ending. All the rules and keys are explained in Akalabeth's Online Documentation. Simply select View Intoduction at the main menu. There are a few commands not listed in the Online Documentation. Akalabeth, Lord British, Ascension belong to Origin Systems Inc. Thanks for the review. Missed out on that game completely during it's day. I might actually want to check it out after reading your review. In all seriousness, I think that Sword of Fargoal would be an *awesome* RPG for a cell phone. It has a very simple and intuitive interface, and unlike most RPGs, is very easy to pick up and start playing. I know that the Doom guys have that "Elves and Orcs" game (I think that's right), but I haven't tried it yet. To be honest, the only cell phone game I really play that much is Frogger. I remember spending a lot of time playing The Sword of Fargoal when I was very young. Now it is a pleasure to play it again not only in the VICE emulator (which now supports other two-player C64 games over internet connections -- wow! ), but also the remake on the Mac or the PC. It is an excellent game for children as well because the maps of each level are always a welcome suprise, which is probably one of the most important features that make it so interesting (sometimes I feel like I have to explore every possible space on a level just to see the whole floor plan before moving on). The wide variety of D&D monsters, and the various traps they set, are another important aspect that make this game so much fun. I'm so glad the author is promoting this game at http://www.fargoal.com/ because it's uniqueness make it an important part of computer gaming history in my strong opinion. I agree with you, Randolf. I agree with you, Randolf. I've had the pleasure of discussing this game with its creator Jeff McCord as well as the Epyx producer, Bob Citelli. Bob had an interesting anecdote--apparently there was some kind of glitch in the code, and they had to scramble to find Jeff and get it fixed pronto. These were the days before patches, so such things were taken more seriously. Jeff is a very, very nice guy and has a terrific ability to talk about his projects. Listening to him describe the creation of Fargoal was almost as much fun as playing the game! I really wish he'd get back into game development in a major way; from what I can see, his genius has remained virtually untapped. I was one of the fans of the original, commodore VIC-20 release.I even devloped an improved clone of this game by myself on the VIC back in the 80s. It took days and days to me to code it.Therefore I was very happy to try this one out, and it was really amazing that it could be coded in C in a so little time.I found the game to be very close to the original, but I reckon it was improved in many ways. I think it should deserve the #1 prize. As an aside, the manual link is now dead. You can still download the PC Remake and C64 versions, though.